Mr Smithers is back in the Man cave and working away on this wet weekend, but the kids are finally back at school (yes they survived the Summer), Smithers is busier than ever and the memory of a rather marvellous and somewhat drunken, childfree trip to Brighton is still fresh in my mind, with the Quadrophenia scenes I visited plus the B.Y.O.C Meaning Bring Your Own Cocktail, so all is pretty good in My World. A thoroughbred Stamfordian I may be, but there is a huge part of me that really identifies with the joy that is Brighton – the unprecedented right to express your own style without risk of judgement or mockery, the barrage of amazing bars with quite possibly the friendliest staff in the world, the stunning architecture made even more beautiful by the bright pop of colourful street art that some hidden artist has chosen to adorn said building with, and the endless supply of quirky shops that dare to be different from the mundanity of the High Street. 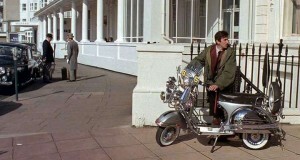 Plus, there’s always the added bonus of searching out some familiar spots where the iconic Quadrophenia was filmed. Long live Jimmy Cooper. In between scouring The Lanes for a few stylish purchases and managing to wander through the exotic beauty of the Royal Pavilion without paying the appropriate entrance fee (sincere apologies, genuine mistake), we (Royal ‘We’ consisting of me, Mrs S and our good friends – The Smiths) found our winding way to an intriguing little bar called The Black Dove. Eclectic, dark, moody and the best wall art I’ve seen in a long time. I didn’t recognise one of the beers in there, but by Christ they tasted bloody good. I’m not sure what was more refreshing – the ice cold liquor whose remnants clung perfectly to the side of my glass or the sheer gumption to only serve up something a little different from the norm. Judging by my wife and travelling companions happy and slightly skewiff faces, their cocktails were pretty good too. 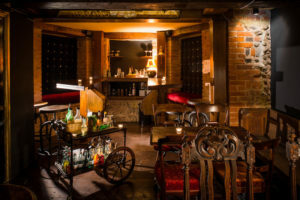 A real highlight for me and my friends though, was a trip to B.Y.O.C in Brighton – a secretive 1920’s style drinking den. To confirm B.Y.O.C refers to Bring Your Own Cocktail and not Boycie’s (this time next year Rodders) as my drunken wife thought! 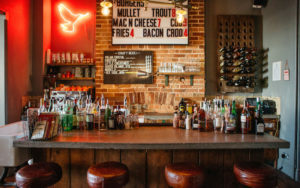 A two hour table with your favourite spirits and a highly trained Mixologist for company guarantees you the best cocktails in town. I won’t say anymore, google it. There’s a few around the country, book a table, preferably in Brighton – you won’t regret it. My friend couldn’t feel her face after her fifth drink. Anyway, moving away from the alcohol chat (I’m giving my liver a rest this month), and back to all things Smithers. This past week, I have been working once again with BBC and the lovely people behind Money for Nothing, Friel Kean Films, but this time, I was in front of the camera. I know people, it’s a scary thought, but believe me, no one was more scared than Mr Smithers. Turns out, I’m a bit of a natural! Yes, the original Victor Meldrew can turn on the charm in front of the lens you know!! We took delivery of the aforementioned Acid Sofa, the striking Guatemalan Chair and a rather dapper looking Bush DAC 1940’s Radio that now flaunts itself as a modern day docking station. All items are now available to buy from Smithers. 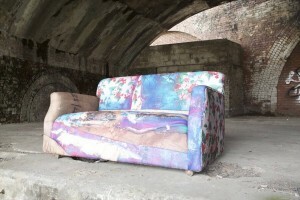 You’re fully aware of my love for the Acid Sofa. T’is but a thing of raw beauty and the ultimate talking point. I don’t want to bore you with repetitive spiel, but this sofa is absolutely awesome in the flesh and such a fresh take on up cycling. The styling almost laughs in the face of recycling, or at the very least, pokes a stick at it. However, the Blue Guatemalan Chair equally holds its own and has also been totally redesigned by The Ministry of Upholstery in Manchester. Hard to believe this azure delight was found in a skip! The eye catching Aztec fabric it’s re-upholstered in comes from A Rum Fellow London and is the perfect backdrop to the bulky hardwood Teak frame. Money for Nothing presenter Sarah Moore and I happily chatted away at Smithers HQ about these amazing products whilst the cameras rolled (I made sure they got my best side), and the transformations these once discarded items had gone through. Never a truer word spoken than “One man’s trash is another man’s treasure.” The first man probably being a narrow minded pillock. Our final item covered in Money For Nothing was the DAC Docker. 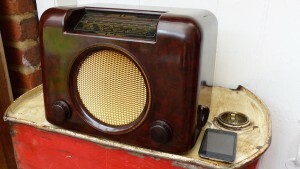 A subtly, smooth looking 1940’s radio that could sit quite comfortably in a smokey filled Gents club back in the day. Made from walnut and Upcycled into a modern day IPod docking station, you’ll love the grunt of the low wattage valve amp combined with the austere finesse of the 40’s. Its a proper grown up boys toy, with a just the perfect amount of understated cool. Needless to say, I want it. The filming must have gone pretty well – Sarah was obviously taken with my camera skills and thought it only a matter of time before I have my own show. I sense there may have been a level of sarcasm in her comments. Goddamit. 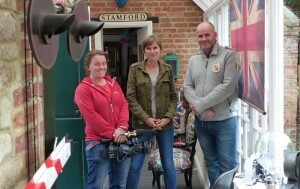 Regardless, my Money For Nothing appearance will be airing on September 10th, 17th and 22nd at 3.45pm. Safe to say, Mr Smithers will not be watching, but you feel free to enjoy yourselves! Smithers will also be appearing in this months Gadget Show Magazine due for release tomorrow (Monday 31st August), under their “We Like” page with our super cool Hulk Table. Magazines, TV… the red carpets surely only a matter of time?! Our Hulk Smash Table has to be the gadgets of all gadgets, so we weren’t entirely surprised when the magazine approached us. 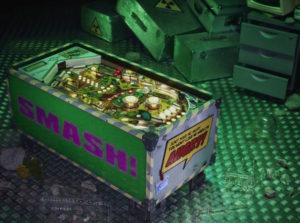 Salvaged from an old 1979 Pinball Machine and upcycled into a Marvel-lous (you see what I did there?) 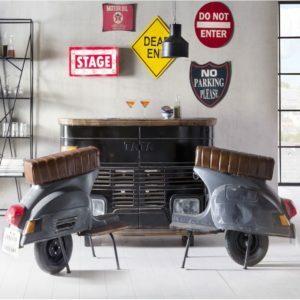 Comic Coffee Table, this is the ultimate in originality. Pay homage to Bruce Banner and his fearsome alter ego, and keep your peepers peeled for this brilliant piece covered by The Gadget Show. There is so, so much going on at Smithers right now that I am desperate to tell you all about, but I fear I may actually be killed if I did. Well, perhaps not, but it is majorly exciting and ever so slightly huge so my lips are sealed until the powers that be say otherwise. I will leave you with one last nod to the lovely Brighton. We stayed at The Artist Residence in Regency Square and I cannot recommend it enough. You know when you stay in some places and it’s just been done so perfectly that you wouldn’t change a thing? Well its one of those places. So unbelievably cool and quirky with just the right amount of attitude. Plus they serve up a pucker cup of coffee. There’s a few of them around so search out the Artist Residence next time you’re planning a weekend away. I think the only thing that would improve the hotels style, would be a smattering of Smithers pieces. Naturally. Copyright © 2019 Smithers of Stamford.